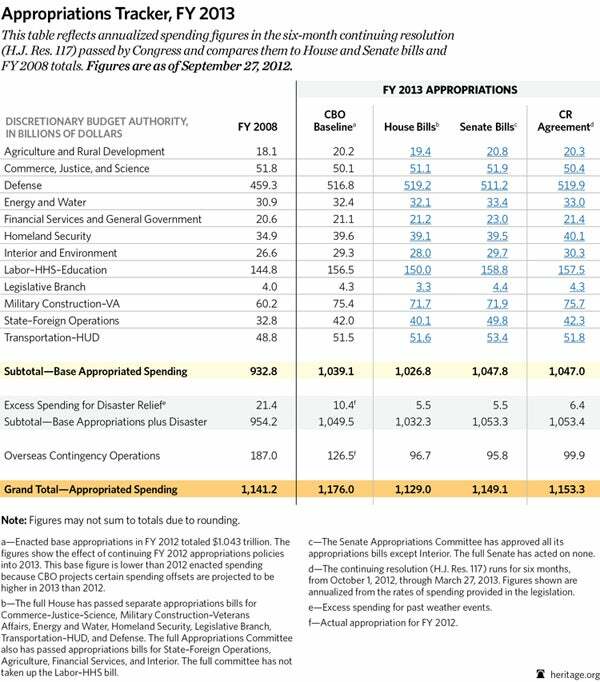 That is $19 billion above the House budget resolution level ($1.028 trillion), but the Senate—which has not passed a budget in more than three years—insisted on this unnecessary spending hike. Congress ignored a range of potential savings options. Knudsen offers examples such as Head Start ($8 billion), Job Training ($15 billion), and Community Development Block Grants ($3 billion). These are just a few federal programs that are ineffective, overlapping, or improperly targeted; their funding should be reduced or eliminated altogether. While Congress managed to pass this stopgap spending bill before the start of the new fiscal year, it will have to take up a measure funding the government again in six months when the funding in this bill runs out. It has also failed to face the looming fiscal cliff, choosing to punt important decisions on Taxmageddon and the automatic budget sequestration into the lame-duck session after the election. Repeated failures to budget according to the regular order erode Americans’ confidence that Congress has the ability to govern, much less act responsibly when so much is at stake. Tracker updated as of September 25, 2012. Emily Goff advances conservative solutions to transportation and infrastructure policy issues as a policy analyst in the Thomas A. Roe Institute for Economic Policy Studies at The Heritage Foundation. Read her research.